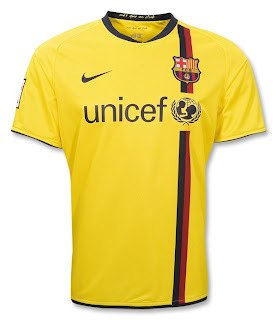 Official FC Barcelona Away Short-Sleeved Soccer Jersey from Nike. The amazing away kit for the 08/09 season is a combination of yellow and indigo. This away kit was also used in 1974 and again when sports kit manufacturers Meyba provided it in the 1980s and start of the 1990s. This new Barça away strip is one of Nike’s major successes: A version of the latest one was first produced in the 2005-06 season - the year the club won the League and Champions League double. 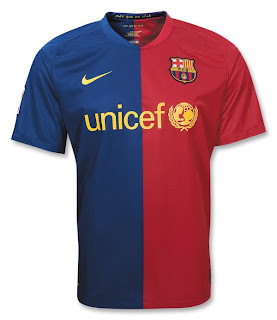 Includes the team badge embroidered on the left chest, Nike logo on right and UNICEF logo on center. With NikeFIT moisture control and wicking weave to keep you feeling fresh and energetic so you can go on cheering on Barça no matter how long the match goes on. For Barcelona standards, last season was terrible. This season brings in a new coach and already a star player in Danny Alves. Some of the core stars, like Iniesta, Xavi and Puyol showed this summer they’ve still got it, and so with a healthy Leo Messi, and Bojan coming into his own (not even talking about Ronnie and Eto’o yet) the guys should see some improvements in these new jerseys.